A bear searches for his missing hat in the bestselling, multiple award-winning picture book debut of Jon Klassen. 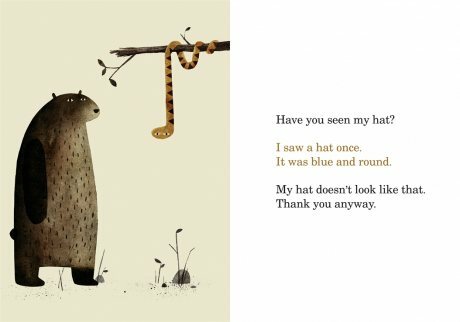 In his bestselling debut picture book, the multiple award-winning Jon Klassen, illustrator of This Is Not My Hat and Sam and Dave Dig a Hole, tells the story of a bear who's hat has gone. And he wants it back. Patiently and politely, he asks the animals he comes across, one by one, whether they have seen it. Each animal says no (some more elaborately than others). But just as it he begins to lose hope, lying flat on his back in despair, a deer comes by and asks a rather obvious question that suddenly sparks the bear's memory and renews his search with a vengeance... Told completely in dialogue, this quirky, hilarious, read-aloud tale plays out in sly illustrations brimming with visual humour and winks at the reader who will be thrilled to be in on the joke. 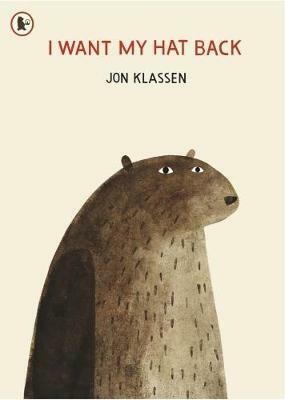 I am HUGE fan of Jon Klassen. I think his work is absolute genius. This witty and slightly sinister (but in a very good way!) picture book perfectly depicts the power of illustration in children's books.